It is hot here in Alabama. We are spending most of out time either in the pool or on the beach. It has been a bit of a surprise that Nora is not a fan of the Gulf. She is perfectly content to stay in the sand and play. Really avoiding the water at all costs. Ben on the other hand has been going head first into the gulf from the get go. 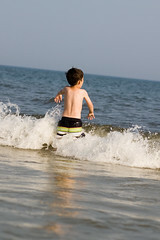 Waves seem to be a source of enjoyment for him – kinda the opposite of what we expected.